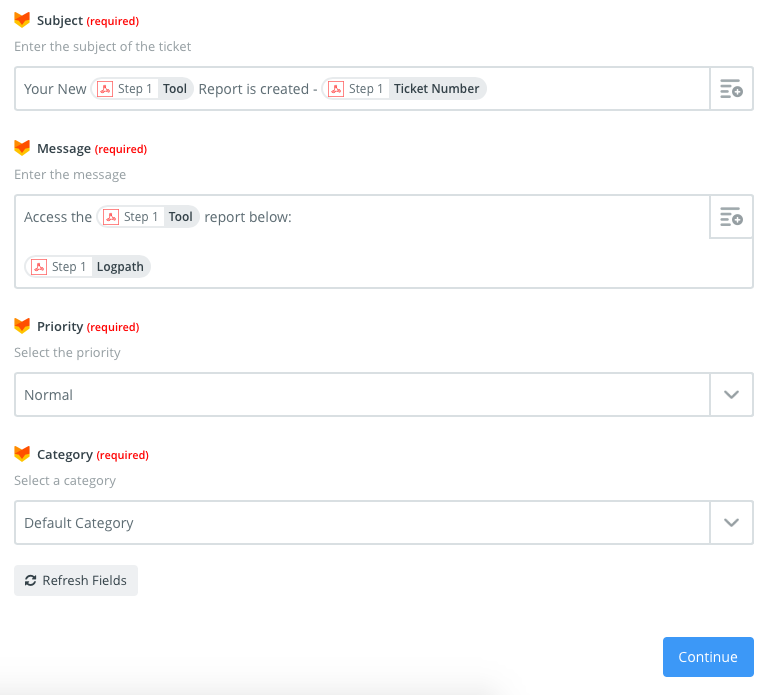 Using Webhooks with Zapier, you can integrate your RepairTech account to create a ticket in HappyFox, each time a report is uploaded through your TechWARU tool. To do this, you'll need an account with Zapier. Click here to sign up for one if you haven't yet. Log in to your Zapier account and click Make A Zap. Under "Choose a Trigger App", select "Webhooks by Zapier". Next, select "Catch hook" as the app's trigger, and hit Save + Continue. You'll then be presented with the option to modify the webhook's payload to include custom information of your own, like your customer's name, email address etc. You may choose to skip this information, as per your preference. Click Continue to proceed. Copy the custom webhook URL that'll appear next, and then head on over to your account in Repairtech. Be sure to leave this page untouched, until you complete step #7. 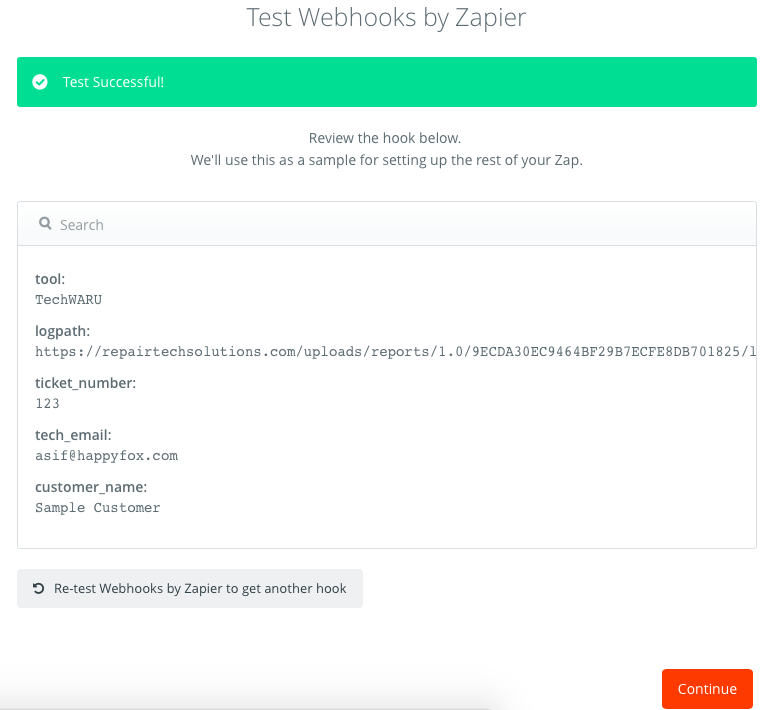 In the box next to Post URL, paste the custom webhook URL you had copied from Zapier(in step #5), and click Test & Apply. You should then see a green banner appear that says "Account settings updated". Now head back to your tab with the Zapier configuration, and click the "OK, I did this" button. The mechanism will now look for the webhook that you'd added and saved in Repairtech. Click continue to go on to create the "action" for your Zap. Select HappyFox, under "Choose an Action App". Select "Create ticket" as the HappyFox action, and hit Save + Continue. You'll now need to connect your HappyFox account with your Zapier account. This here is a one time action, and once its connected, it will remain so for your future Zaps(unless manually removed). If you already have connected your account, select that account and click continue. If not, click "Connect a New Account"; a new window pops up requesting for information on your HappyFox account along with its API credentials. Open up a separate tab, log in to your HappyFox account as a staff, and head to Manage >> Integrations >> API, and click the "+" next to "Add new API key". 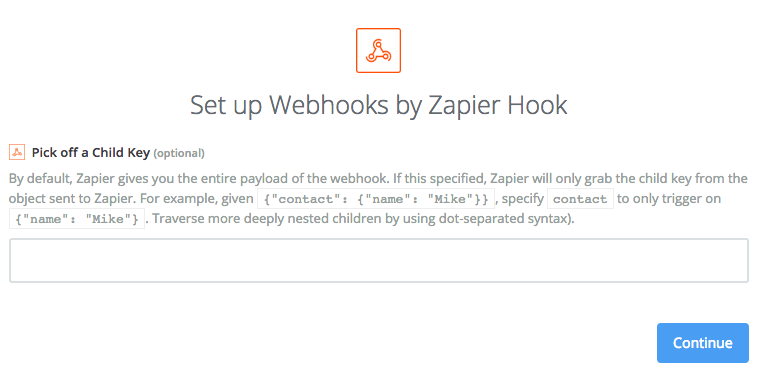 Here, you'll be able to create the API key and Auth code to use with your Zapier integration. Check out our article on how to create an API key and Auth code in your HappyFox account. 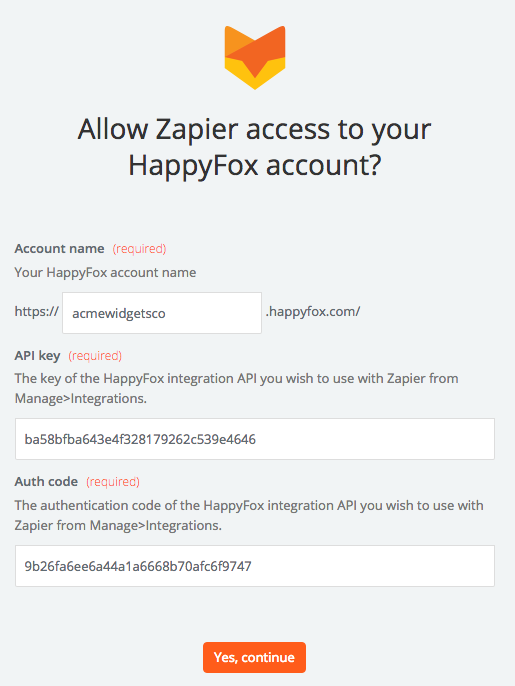 Head back to the pop-up from Zapier, and include your HappyFox account's name, your HappyFox API key and the Auth code. When done, click "Yes, continue". Once you've connected your account, you'll then have to configure the template of how the ticket should appear when it is created, and what information should be plugged into each respective field. Clicking on the option menu button as shown below, will provide you with a list of fields from your Repairtech account that can be set to be plugged in automatically. When the fields are all filled out, click Continue to proceed. 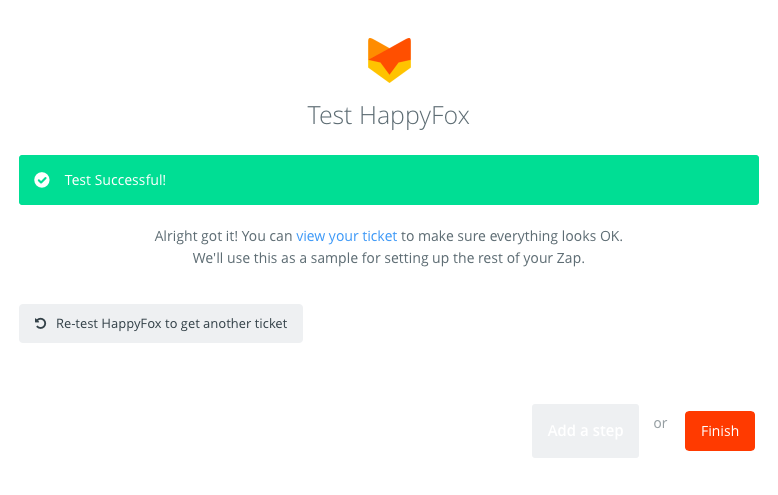 You will then be provided the option to test the Zap, and see how the ticket appears in your HappyFox account. You may then modify the template accordingly, as per your needs. Once you're done testing, click Finish. Then provide your Zap a name, and click the button to switch it "ON". You'll then receive a confirmation that your Zap is now active. Note: When setting the template for your HappyFox action, in case you're not seeing a particular Category that you want to select, please make sure that the category has its Availability set as "Staff & Contacts".